A waitress's affair with a lifeguard is threatened by the arrival of her husband's estranged daughter. The great 1960s TV show The Fugitive spun many a tale over the course of its 120 episodes, but most followed a variation on a simple template - protagonist Richard Kimble would take a job and befriend or become romantically involved with his employer, leading to him making an enemy of a villainous love or business rival who then betrays his whereabouts to Lieutenant Gerard, the Chicago detective spearheading his manhunt. 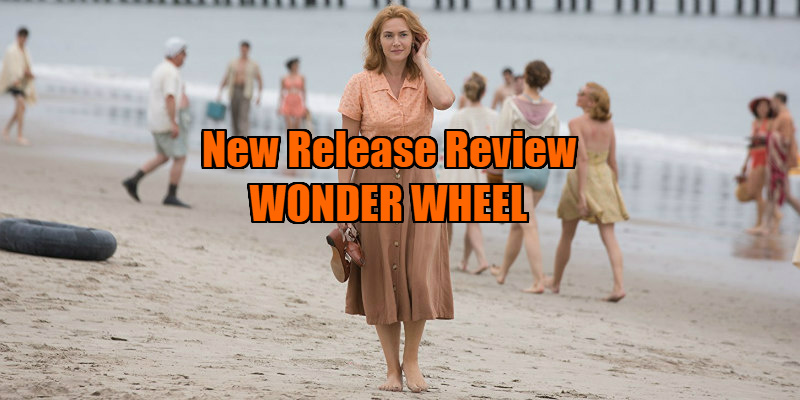 With his latest, the 1950s set misanthropic melodrama Wonder Wheel, Woody Allen delivers a narrative that plays like an episode of The Fugitive told from the point of view of the villain. It's an intriguing idea, but Allen's script is far too jumbled and unfocussed to explore the concept successfully. The Kimble substitute here is Carolina (Juno Temple), who goes on the run from her mobster husband when a hit is ordered on her life for becoming too knowledgeable of her hubby's illegal activities. Not the sharpest pebble on the beach, Carolina seeks out her estranged father, the ridiculously monikered Humpty (Jim Belushi, continuing a late renaissance after his run on last year's Twin Peaks revival), who runs a struggling carousel on New York's Coney Island. At first he's none to happy to be reunited with his daughter, but Humpty quickly warms to her, as does his current wife, Ginny (Kate Winslet), who gets Carolina a job working alongside her at a local oyster restaurant. Meanwhile, Ginny is in the throes of a heated affair with hunky lifeguard and wannabe playwright Mickey (Justin Timberlake). When Mickey is introduced to Carolina, and the two bond over their shared interest in literature, Ginny becomes increasingly paranoid and jealous of her husband's daughter. Oh, and her young son, Richie (Jack Gore), enjoys setting fire to stuff - this subplot leads nowhere. That synopsis makes Wonder Wheel seem a lot more straightforward than the rambling mess that actually plays on screen. 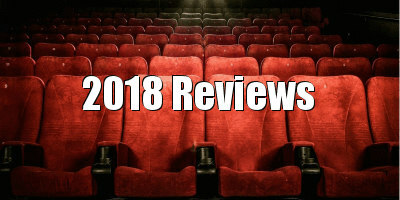 At its core it's a thriller, a genre Allen has been exploring with mixed results since his 1989 masterpiece Crimes and Misdemeanors. That film is as great a comedy as it is a crime drama, but there Allen keeps the two genres separate, with two distinct storylines playing out. Wonder Wheel doesn't work as either a comedy or a thriller, because it doesn't seem to realise which genre it wants to lean towards. There's no real comedy on display here, and it's ultimately one of the thematically darkest films Allen has ever crafted, yet he bizarrely interrupts his story with the woefully miscast Timberlake (in a role that seems tailor made for Ryan Gosling) narrating the proceedings like a mix of Greek God and Greek Chorus from his lifeguard perch. This raises the confusing and unnecessary question of whether the story we're witnessing is a work of fiction on his character's part or whether he's simply relaying a real life experience. If it's the latter, how are we seeing scenes Mickey isn't involved in, and why is Ginny the focus of the story? If it's the former, at least there's an excuse for some of the cringe-worthy dialogue we're forced to endure ("The heart has its own hieroglyphics!"). To confound things further, in these segments Timberlake plays the character as though he's impersonating the unique mannerisms of Allen himself, all flappy hands and nebbishy over-enunciation, while in the main narrative he plays it relatively straight. We get to see two distinct Timberlakes here, and they're both atrocious. Equally difficult to watch is Winslet, not because she's a limited actress but because the character she's playing is insufferable, the sort of whiny nervous wreck Shelley Winters made a career out of playing, but unlike Winters, Winslet is taking this all very seriously. If you don't want to strangle her by the hour mark you're a more tolerant viewer than I. Rather than Winslet's insufferable and unlikeable Ginny, the character who should probably be Wonder Wheel's protagonist is Temple's Carolina, not just because the young British star delivers the film's best performance, but because she's the only remotely sympathetic figure in the story, and allowing us to spend more time with her would have made the final act, when Ginny's jealousy turns sinister, play out in a satisfyingly suspenseful manner. 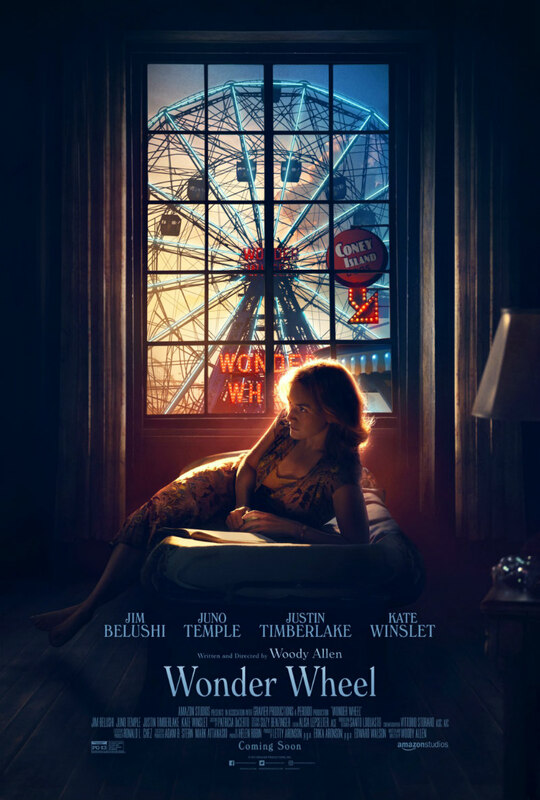 Wonder Wheel isn't the worst movie Allen has ever made, but it might be the worst he's ever written. Thank Italian cinematography God Vittorio Storaro then that it's one of the best looking movies Allen has delivered in years. From the magic hour sunlight of its beach scenes to the neon glow that lights Ginny and Humpty's home in the shadow of the titular ferris wheel, Storaro creates some of the most stunning images of his stellar career. With this and the dramatically inert Café Society, we've now gotten two Allen movies in a row that have been redeemed only by Storaro's work. The two continue their collaboration on Allen's next film, A Rainy Day in New York - let's hope that one offers more than just pretty pictures. Wonder Wheel is in UK/ROI cinemas March 9th.